← Caffeine Addiction: Is that espresso more than you bargained for? Part of the success of any coffee shop is the culture and atmosphere created in it. Jobot, Songbird, Shine, 8th Day, Dutch Bros. and Starbucks represent some of the various atmospheres and coffee cultures in downtown Phoenix. Each of these coffee shops has a different atmosphere that makes it original and successful in its own way. The chain shops, Dutch Bros. and Starbucks have clear atmospheres they are looking to create because these companies have multiple location and they want them all to have the same feeling. senior manager, Global Brand PR Starbucks. Dutch Bros has an even simpler goal for their atmosphere, “The atmosphere is always fun and friendly,” Josh Hayes, regional manager and trainer for Dutch Bros. Arizona said. 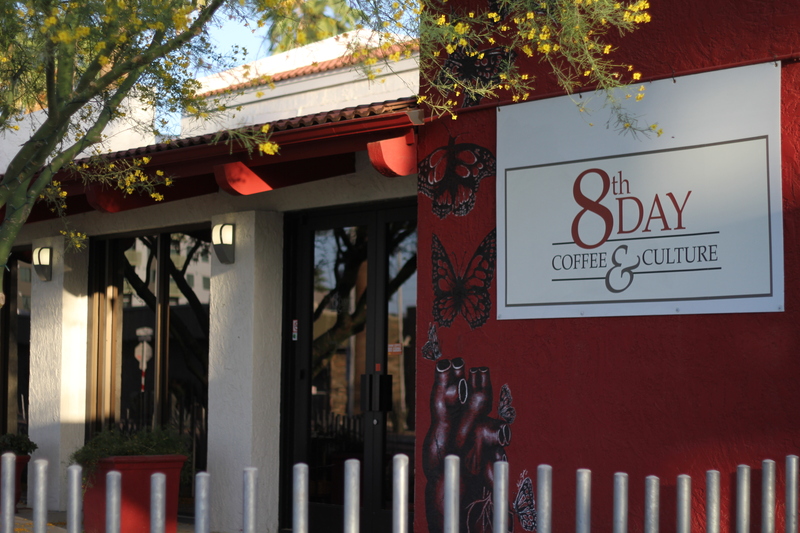 8th Day, a locally owned coffee shop, does not have multiple location and have a very specific atmosphere they are trying to create at their shop. Daniel Davis, manager of 8th Day Coffee and Culture said. Customers are the most important things to any business. The idea behind every shop’s atmosphere is to attract customers and make them feel welcome and comfortable. Most of the coffee shops emphasized that diversity of clientele is what they see at their shops. “We have definitely got the street artists and then you got the lawyers. Everybody comes in. It’s really weird even how the whole thing came together,” Sagasta said. The chain coffee shops had a much harder time giving any sort of specific description of their customers since franchised shops can see millions of varied customers in a day. Many people frequent the same coffee shop and many coffee shops see a good amount of regulars every day. Songbird attributes the type of regulars they see in their shop to the atmosphere they create. “It’s a lot of creative people and entrepreneurs, starting their business, artists. This space kind of builds creativity,” Carroll said. Laryn Blok,owner of Shine, another coffee shop, said in an email that he does not think his business sees many regulars and he likes it that way. Ultimately the drinks and the culture at any given coffee shop is what bring people back for drink after drink. Sagasta thinks it’s their local business status and the culture of people that strive to support them that brings people back to Jobot. “Its people that want to support local businesses. They like that personal approach. I think Starbucks is losing market share because of that. People see them as McDonald’s now. I think that’s it. I think people are developing a more educated pallet when it comes to coffees,” Sagasta said. Shine owner Blok said that their personal touch and welcoming atmosphere brings people back. Starbuck and Dutch Bros. had very similar ideas about why people come back to their shops. The customization and personalization of all their different drinks is why people keep frequenting the coffee chains. “I would say it is the great quality coffee, the guarantee that it is going to be the same experience every time so you know that you’re coffee is going to be made right and made to your specifications,” Martinez said. As much as we might think that the is a subculture in our society that frequent coffee shops, the reality is that there are so many different types of coffee shops with such diverse customer bases that there is a coffee shop out there for anyone, even those who do not drink straight coffee. Posted on April 28, 2013 by sopheymay12	• This entry was posted in Atmosphere. Bookmark the permalink.